In what could have been a catastrophe at the Rasselas Jazz Club last Sunday night for the Wilbur Rehmann Quartet show, (It seems the owner inadvertantly double booked the evening! ), the gracious Caroline Chung of Brazuca Brown, stepped aside and wished us good luck. So moved was I by the group's generosity, that I endeavored to find out more about her and her band. Rehmann's show I might add, was a smashing success, and in the aftermath of that evening, I found another pleasant surprise in the wonderful and innovative Brazilian music of Brazuca Brown and it's offspring, the Brazuca Dub Quartet. Considered the "Bay Area's most innovative Brazilian band", Brazuca Brown fuses traditional music with modern technology. The group came together in 2004, when they began combining percussion and complex Brazilian rhythms with the "post-tropicalia" musings of today's DJ culture. The result is a groove oriented "samba-electric" flavor, powered by the high energy drumming of the "bateria", the drum ensemble that powers the samba schools during Carnival. 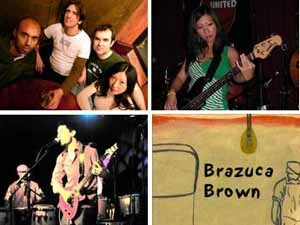 Brazuca Brown is ably led by bassist Caroline Chung, Cris and Nick on drums and percussion, and the wonderful Antonio on vocals and guitar. Often Brazuca Brown can seen as an "orchestra", with Danny Cao on trumpet, Carlinhos Baiano and Sam Hicks, also on percussion, or in a smaller unit known as the "Brazuca Dub Quartet". Brazuca Brown has been a regular fixture at the Elbo Room, and has been seen at Bruno's, The Cigar Bar, The Make Out Room, Cafe Du Nord, and the Independent. Their polyrhythmic textures on songs like, "Onde Anda" and "Avaio" stopped me in my tracks. The take no prisoners funk of "Descobrido dos Mares" and "No Caminho Do Bem", will make you want to get up dance, without a doubt. Antoino's vocals and guitar work is fantastic, and must bee seen to be fully appreciated. Chung holds down groove like nobody's business on bass, and the guys on percussion are just well, "disgustingly talented". So if you are in the mood for some fiery samba, funky bass, ridicolously infectous percussion, don't wait for Carnival to see Brazuca Brown, in any of their incarnations. You will be glad you did.